Fazer Peppermint Crisp Bar - 7 oz - 50% Off Or More! Please note: Only available for shipping within the United States. High quality, delicious, holiday joy! Also big hit among our kids and their school friends! The Fazer Peppermint Crisp bar is one of my favorites. Perfect for the holidays. I bought this for my friend from Finland and she said it is her favorite chocolate bar. She even mentioned she prefers this as a present to other gifts. 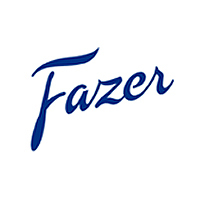 Fazer chocolate bars have been a family favorite from several generations back. The Fazer Marianne Mint Candies were one of my favorites as a teen. The Fazer Peppermint Crisp Bars combines the best of Fazer chocolate with the crispy, crunchy peppermint flavor of the Marianne mints. The family has chosen this bar as our other 'must order' along with the Hazelnut bars themselves. Ordering some now before it gets too hot to ship chocolate. Great tasting and a perfect gift! 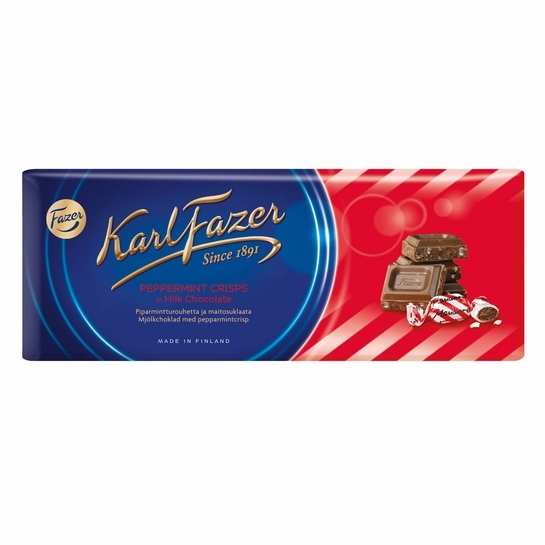 If you like Fazer chocolate and Peppermint, you will love this! Smooth and creamy chocolate with high quality peppermint flavor. This is a large chocolate bar that breaks easily into uniform squares. The chocolate has a good mouth feel and pleasant flavour. The peppermint is present without being overpowering or biting. Well worth ordering for a special treat. I got this as a Christmas gift along with Taika bowls. Hard to say which part of the gift I liked better! This is great milk chocolate, and the peppermint gives it an unusual twist. Highly recommended! Although I really like the original milk chocolate, this is a great alternative as well! Fazer stuns with this gem. The same creamy, perfect mil chocolate Fazer is known for with ground pieces of peppermint to give it the perfect accent. Not too minty, the balance is superb. Also, FinnStyle delivered this to me quickly and fully in tact on the busy week before Christmas. Fazer chocholate is the best in the world. There are nothing even close to it. And for Xmas the divine milk chocholate with Peppermint: Pure perfection. Peppermint bark....goodbye!